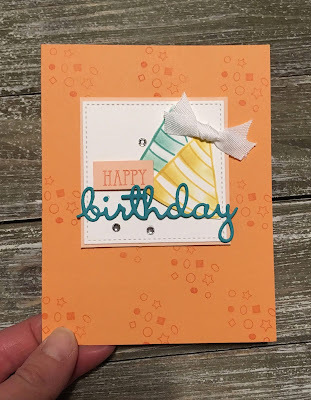 Karina's Kreations: Stampin'Up Birthday Cheer! Make a cute Birthday card with the Birthday Cheer stamp set and coordinating Detailed Birthday Edgelits Dies. When you purchase these items as a bundle, you'll save 10% and earn a free Sale-a-bration items. The Sentiment and word die is from the Well Said Said Bundle. There are 24 dies in this bundle. I got this cute card from my friend Sue.